BetOnline is a popular online casino that welcomes players from around the world, including the United States. It provides an amazing selection of 3D slot machines as well as other casino games, and it offers many different bonus options that you can claim to get even more out of your bankroll. Register with our exclusive BetOnline bonus code CASINO1 and receive a 100% deposit bonus for up to $1,000! Then redeem the BetOnline promo codes CASINO2 and CASINO3 for additional deposit bonuses of up to $1,000! The exclusive CASINO1 bonus offers a 100% match on your deposit, up to the maximum amount of $1,000. The minimum deposit allowed to participate is $25. There is a 40x wagering requirement on the sum of the deposit and bonus amounts. This wagering requirement must be completed prior to any cashout or the bonus amount will be removed from the requested withdrawal amount. This is a slots only bonus, so no video poker, blackjack, roulette, etc will contribute towards meeting the wagering requirement. This is a “sticky” bonus or non-cashable bonus. So you cannot withdraw any of the bonus dollars; The bonus amount will be deducted from your cash out. However, any winnings earned from playing the bonus dollars is yours. This bonus is redeemable up to 3 times, but you must use the promotion codes CASINO1, CASINO2, and CASINO3. As an alternative to the CASINO1 welcome bonus, BetOnline Casino offers slots fans a 100% match on every deposit of $100 or more. To claim the bonus, you simply have to use the promotional code BONSLOT during the deposit process. The bonus is limited to $1,000 on any one deposit, so you wouldn’t want to deposit more than $1,000 at a time. Also, there’s a caveat preventing you from claiming this bonus on multiple deposits in a short period, and that is: You must have a balance of $0.00 in order to use the BONSLOT code. Outside of that criteria, you’re entitled to take advantage of the promotion as many times as you want. The wagering requirement for this promotion is a 50-time rollover on both the deposit and the bonus. So, if you deposit $250 to claim a $250 bonus, your rollover requirement would be $25,000. Keep in mind that only wagers made on slot machines count toward this requirement. Finally, the bonus and requirements are restricted to the standard casino and not applicable for mobile slot games. A popular aspect of BetOnline is its live casino, which gives you the chance to play classic casino tables games with actual human dealers and croupiers. The casino event offers a $25 risk-free bet, which we’ll talk about more shortly. The three main offerings at the casino are Baccarat, Blackjack and Roulette. The service provides high-quality high-definition streams, and players can opt for an experience that emphasizes the video feed or the gaming interface. 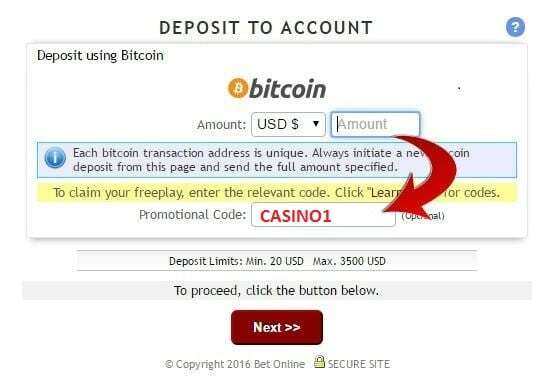 BetOnline wants you to try its live casino experience, and if you’re willing to do that, it will make your very first bet risk-free. To take advantage of this offer, simply enter the live casino and make an initial wager of at least $25. If you win, congratulations. If you lose, the casino will give you a $25 free bet for the live casino. Note that first bets greater than $25 still only receive a $25 free play. Also, the bonus isn’t automatic. Instead, you’ll need to contact the casino by email within 24 hours of making the bet. Be sure to include your account ID and game ID. The casino will then send the free bet to you within 24 hours. The free bet has a six-times rollover requirement, which amounts to $150. The monthly high roller bonus applies to any BetOnline member who generates at least $75,000 in action in a given month. Keep in mind that you don’t necessarily have to deposit or lose $75,000. You could, in theory, generate that kind of action with just a minimum deposit. The minimum high roller bonus is $50, and the maximum bonus you can earn is $1,000. One downside to this bonus is that the casino doesn’t alert you to eligibility. Instead, you have to email them with the subject “High Roller Bonus” during the first week of the month, and customer support will get back to you within 24 hours. This bonus has a 50-times rollover bonus and some exclusions, such as Blackjack and Baccarat. In addition, you can’t claim this bonus if your account balance is greater than $0.00. BetOnline gives all members access to a 25% reload bonus whenever they make a $25 or greater deposit. The caveats are that you cannot have a balance greater than $0.00, and you cannot have any pending wagers or bonuses. To claim this bonus, simply use the promotional code CASINO25. On a $25 deposit, you’d earn a bonus of $6.25, but the bonus can be as great as $1,000. Like most bonuses at BetOnline, this promotion has a 50-times rollover requirement. So, if you claim the minimum $6.25 bonus, you’d have to wager a little more than $1,500 to clear it. Game exclusions include Baccarat, Blackjack, Craps, Roulette and any mobile games. The rebate program at BetOnline Casino is a form of gambler protection. How it works is that if you lose more than $100 in a given week, the casino will give you a rebate worth 10 percent of that amount. Keep in mind that the rebate is based on net losses. In other words, if you gamble $100 and lose and then gamble $100 and win $200, you’d break even and have $0.00 in losses to claim. Weeks begin on Monday and end on Sunday. After a week in which you’ve lost $100 or more, simply email the casino with the subject “10% Casino Rebate,” and it will send you the bonus within 24 hours. This bonus also has a 50-times rollover requirement, and game exclusions are as indicated for the reload bonus with the addition of all live casino games. BetOnline Casino also offers a selection of skill games. These are games that you wouldn’t necessarily associate with a casino and certainly not an online casino. The games are Dominoes, Gin Rummy, Spades, Tonk and Yahtzee. These games are actually available to play for free and with no money on the line. All you need to do to have access to these free games is register a BetOnline account. If you want to play for money, you can do that, and the neat thing here is that you’re playing against other people like you just as you would in a game of poker. Check out the popular BetOnline Casino today! You can read a good review of the BetOnline Sportsbook and promo code at Betting Sites USA. You can read a good review of the BetOnline Sportsbook at Betting Sites USA. Did You Like This Bonus? Leave a Review! I followed the directions for the CASINO200 code and it was accepted and I got my 200% bonus as advertised. Note that 50 times wagering requirement is a lot - but the bonus makes up for that so you have plenty to play with for a long time. The best thing is the live casino bonus - so if you sign up, be sure to get that extra 25 bucks!